This week I am writing lectures about typographic design in motion, kinetic type exercises will abound. I have once again come across a few favourites in my process, firstly, the beautifully simple website Typographic Design: Form and Communication and secondly, the typeface Mrs Eaves from the Emigre Foundry, it appears the Mrs Eaves has at long last found her man. 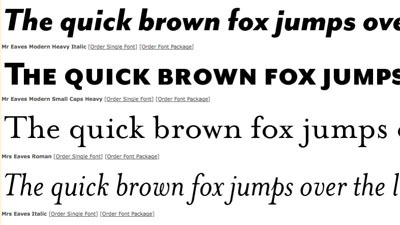 Emigre have just released the simple yet stylish, Mr Eaves. This entry was posted in Design and tagged animation, type. Bookmark the permalink.